Malnutrition lowers the body’s natural ability to fight off infections, and can cause loss of muscle strength and reduce bone strength. Ill or loose fitting dentures may rub up against the gums and create a callus, also known as epulis which requires oral surgery to remove. Relining. A liquid acrylic molds the denture closely to shape of the gums. Recasting. The dentures can be re-made to get a better fit. Don’t use regular toothpaste on dentures because they are too abrasive and can damage dentures. When brushing, remember to brush the gums, tongue and palate to keep potential irritants clear before putting in dentures. Always store dentures in a denture container with water to keep moist, they should never get dry because that may change the shape and fit of the dentures. Dentures should be kept in a safe place as they are delicate and can break easily if dropped just a few inches. Dr. Kaufman, a top 25 dentist in the U.S.,understands that each patient is unique and may have various health problems or mobility issues. Asking questions and sharing concerns about geriatric dental care is valued and encouraged. Dr. Kaufman has over 30 years experience in dentistry and is the geriatric house call dentist in Manhattan, for more information about loose dentures NYC residents need help with, or to schedule an appointment, contact us today! Don’t Fall Prey to Thinking that the Elderly Don’t Need Dental Treatments! Dentistry has come a long way since the early 1800s when barbers were the most likely ones to treat dental issues. Referred to as barber-surgeons, these men would often cause more problems than they fixed by suggesting such things as picking your gums with the bill of an osprey in order to soothe aching teeth. We are grateful that dentistry has improved since the days of barber-surgeons and osprey picks. However, there still exist challenges to which much of the dental world has yet to catch up. For the aging population, it can be extremely difficult to travel for dental care. Thankfully, there are still pioneers in every medical field. Dr. Alisa Kauffman has been offering bedbound dentistry to this growing population for over 30 years. Seeing a problem with very few solutions available, Dr. Kauffman began offering homebound or bedbound dentistry early in her dental career. And while much of the world relegates dental problems in the elderly to simply ‘not worth the trouble’, Dr. Kauffman believes that treating the dental pain and discomfort in these patients can improve outlook, behavior, and even health of the individual. If you’re wondering what issues a bedbound dental service might even be able to treat, you may be surprised at the breadth of problems that can be fixed right at a patient’s bedside. What conditions might bedbound dentistry treat? Dentures can prove extremely frustrating to your elderly patient or loved one. If they are too loose, they will continually fall down or out while trying to accomplish such simple tasks as eating and even talking. Over time, this continual irritation can lead to the elderly simply giving up on either activity unless absolutely necessary. A skilled dentist that provides bedbound dentistry is able to handle this problem with ease. She will either reline the old denture, ensuring proper fit, or fabricate an entirely new one right at the bedside. Again, another irritation for eating and talking, a broken tooth can also bring with it infection and swollen gums and cheeks. A bedbound dentist is able to assess the situation right away, remove any loose or broken teeth, and determine if infection is present that must be addressed. 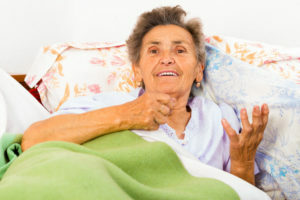 A common concern we hear among caregivers for the elderly is that brushing only results in bleeding gums, and the teeth seem to be so coated that they do not clean properly, no matter how hard they try. In this case, the patient simply needs a deep scaling and prophys. The deep scaling and prophys removes hard calculus below the gums and on the brushing area of the teeth. After this coating has been removed, the bedbound dentist will take time to instruct the caregivers on the proper methods for tooth cleaning for elderly, even offering some tips for making the experience easier for both parties. These are only a few of the most common treatments given during bedbound dentistry. A house call dentist can also offer such things as fillings, tooth extraction, new dentures and comprehensive preventive care. Perhaps it’s time to offer your patient or loved one a proper dental checkup through bedbound dentistry services. Put the osprey away and pick up the phone. Your loved one will be thankful you did! Call Dr. Kauffman today at 917-826-6278. Bringing the utmost in compassionate and attentive in-home dental care to Alzheimer’s patients throughout Manhattan. Are you or a loved one in need of dental care, but unable to easily leave your home? You’re not alone. NYC is home to many geriatric patients who live comfortably in their homes, unable to easily make trips to see a doctor, much less a dental professional. With a passion for patients with Alzheimer’s disease, Parkinson’s Disease, and Dementia – Dr. Alisa Kauffman has made it her career goal to actively reach out to geriatric patients in need of dental care. If you’ve been trying to find dental professionals to provide a loved one with compassionate Alzheimer’s dental experience NYC trusts, then you’ll want to hear about the good work happening at Geriatric House Call Dentistry. Dr. Alisa Kauffman, Director of geriatric dental care at 3 local nursing homes, and director of the Dental LIFE Program (Living Independently for Elders), specializes in bringing attentive dental care to geriatric patients throughout Manhattan. In 1995, Dr. Kauffman made Geriatrics her primary focus, and discovered her love of bringing compassionate care to geriatric patients in New York. She spent the following 25 years refining her skills treating the geriatric frail population. In 2010 she used that valuable experience in opening the dental clinic LIFE Center (Living Independently For Elders) at the University of Pennsylvania School of Dental Medicine where junior and dental students get to experience treating the geriatric population. For a loved one with Alzheimer’s, nothing is of more importance than compassion. For a loved one with limited mobility or a complex health status such as Alzheimer’s, you deserve a dental professional with the utmost Alzheimer’s dental experience NYC has to offer. Dr. Kauffman’s heart for the elderly has placed her among the top 25 women in dentistry, and makes an unforgettable difference in the lives of the people she helps. 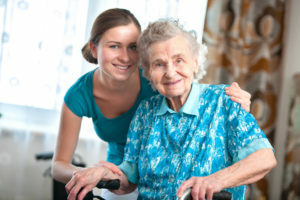 Geriatric House Call Dentistry is able to provide all of the above services, greatly reducing your loved one’s risk of serious oral health complications. In addition, Dr. Kauffman is highly experienced in making patients with dementia and Alzheimer’s feel comfortable, and communicating with them about dental care. Working alongside families, caretakers, and physicians, we aim to provide our older patients with the best possible care. Contact Dr. Kauffman online, or give her a call at 917-826-6278 for more information. To discover more about what to expect when Dr. Kauffman visits you or a loved one, please check out this video.